Municipal offices will be closed on Monday, Feb. 19, in observance of President's Day. Trash and recycling will still be collected as scheduled on Monday. Our offices will reopen for business on Tuesday, Feb. 20. Have a wonderful weekend! Extreme cold in the forecast for this weekend: Be prepared! Extreme cold is in the forecast this weekend, and a Code Blue Advisory is in effect from 6 p.m. Friday, Feb. 13, until 7 a.m. Saturday, Feb. 14. Such extreme temperatures present significant health and safety challenges, and the Cherry Hill Office of Emergency Management reminds residents to be prepared and take these potentially dangerous conditions seriously. We remind residents to check frequently on friends and neighbors who are elderly or disabled, and to keep pets indoors to ensure their safety. If you or someone you know needs assistance finding a warm place to stay, please contact the Office of Emergency Management at (856) 432-8836; after hours, call Police Dispatch at (856) 665-1200. Click here for additional preparedness information from our Office of Emergency Management. 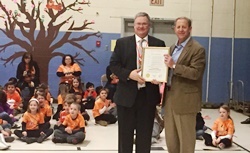 On Monday, I visited Thomas Paine Elementary School to kick off Thomas Paine Kindness Week and celebrate the school's designation as a New Jersey School of Character for 2015-2017. This prestigious designation is given to schools and districts that demonstrate outstanding character education initiatives that result in positive student behavior, school climate, and academic performance. Congratulations to Principal Kirk Rickansrud and the entire Thomas Paine family on a tremendous achievement! Cherry Hill now offers paperless billing for all residential and commercial Township sewer bills. Electronic billing makes information easier to access, and reduces costs associated with printing and mailing sewer bills. Homeowners must enroll by March 10 to ensure the change takes effect for the 2015 residential sewer bill. Commercial sewer accounts must enroll by April 10. Click here to learn more. 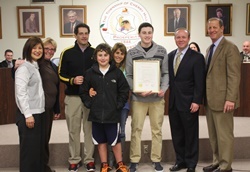 At Monday night's Township Council meeting, Mayor Cahn and Council were proud to honor Cherry Hill West senior Dan Joffe, who helped to coordinate the Township's Martin Luther King Day of Service on Jan. 19. As a result of Dan's efforts, the Township and more than 150 volunteers collected donations for five local charities, and completed much-needed improvements to our public lands at Croft Farm. Thank you to Dan and all of our MLK Day volunteers for all of your hard work and dedication to making our community stronger. Click here for additional photos from Monday night's presentation. Cherry Hill's annual Free Conference for Professionals and Parents of Children with Special Needs will take place from 8:30 a.m. to 1:30 p.m. Saturday, March 7, in the Carman Tilelli Community Center. Speakers from Weisman Children's Rehabilitation Hospital will discuss encouraging developmental and intellectual gains through fun social environments, and sensory-behavioral strategies for picky eaters. Attendance is free, but registration is preferred. For more information, call (856) 488-7868, or e-mail Ombudsman@CHTownship.com. Join us for a discussion of "Boardwalk Empire: The Birth, High Times and Corruption of Atlantic City" by Nelson Johnson. Lit With Librarians is a free, library-sponsored book club for adults conducted by librarians from CHPL. No registration required. Over the past 30 years, Bob Minnick's artistic style has evolved from realism to a combination of realism and expressionism. Attend this free reception to the artist and view his work that highlights his love of color, texture and composition. No registration. Show on display through Feb. 27. Children ages 4 and up are invited to this introduction to Spanish. We'll meet to practice our new vocabulary with bilingual stories, songs, and more! Click here to register. The Who Was Book Club: Who was Harriet Tubman? Calling all fans of the popular Who Was series! Join us each month as we learn about a different famous person from the past. This month we'll learn about Harriet Tubman. Open to grades 1-3. Click here to register. Can't make it to our daytime story times? Join us Wednesday evenings for stories, songs and crafts from that week's Little Listeners and Story Time. Best for ages 2-6. No registration. Writers of all styles and skill levels are invited to attend a monthly discussion group where attendees can discuss their writings, improve their skills and offer encouragement to one another. At each meeting, attendees will have the opportunity to share their writing, ask questions, brainstorm, and collaborate with other writer’s on writing projects. Feel free to bring extra copies of your work for others to read. New members welcome! No registration. This hands-on class goes beyond basics of searching the Web and introduces more advanced techniques. The class will explore the web browser, various web sites, and searching the Internet. Audience Level: Adults with PC experience required. You must be able to use mouse and keyboard. Click here to register. Sing along to one of your favorite movies! We'll be screening Disney's Frozen and invite kids of all ages to join in the musical fun. Feel free to dress up as your favorite Frozen character for this event! Click here to register. This week, Councilman Brian Bauerle and members of my administration joined me in hosting the latest meeting of the Cherry Hill Business Council. 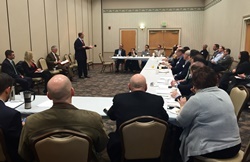 Over the course of about an hour and a half, we updated more than 50 members of the local business community on news, events and information about a variety of initiatives underway both in Town Hall and around Cherry Hill. It was a lively discussion attended by a wonderful, engaged and enthusiastic group. Thank you to the Katz JCC for their hospitality in hosting this month's event. To learn more about the Business Council or its residential counterpart, the Citizens Cabinet, please contact my office by calling (856) 488-7878, or e-mail Donna Dovey at DDovey@chtownship.com. Cherry Hill Township and the AARP have once again partnered to offer seniors free tax-preparation assistance from 10 a.m. to 2 p.m. every Tuesday and Friday until April 14. No appointments are necessary. All tax-prep sessions will take place in the N. John Amato Council Chambers (Room 208) at Town Hall. Electronic filing and direct deposit are available to help expedite returns. Click here for more information, or call the AARP directly at (888) AARP-NOW. 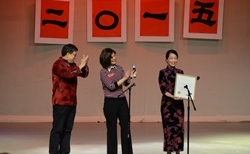 Last Saturday afternoon, Councilwoman Susan Shin Angulo joined the Huaxia Chinese School in celebrating the start of the Chinese New Year, at the organization's annual New Year gala and celebration. Hundreds of guests from around South Jersey enjoyed a day of traditional song, dance and other cultural festivities, held at Mount Laurel's Harrington Middle School. The Chinese community will officially mark the start of the New Year (the Year of the Goat) this Monday, Feb. 19. Thank you to the Huaxia School for inviting us to take part in this year's celebration. On behalf of Township Council and the residents of Cherry Hill, I want to wish our entire Chinese community a very happy, healthy and prosperous New Year! Winter can wreak havoc on road surfaces, and we inevitably see a spike in potholes popping up across town during these cold, snowy months. The Department of Public Works is responsible for the repair and maintenance of nearly 260 miles of municipal roads, and has dedicated crews assigned to the task of filling these potholes as quickly as possible. You can report an area of concern online by clicking here, or by calling Public Works directly, Monday through Friday, at (856) 424-4422. Click here for a list of roads that are maintained by Camden County or the New Jersey Department of Transportation. Drive safely! The Cherry Hill Fire Department EMS Training Division has several classes scheduled in the coming months. To learn more, or to register for a specific class, click here. Seniors graduating from any Camden County high school in 2015: If your passions and field of study toward your career goals include a field that supports sustainable living, or you want to be an agent of change in the world around you, apply for this new scholarship being offered by Sustainable Cherry Hill. Please click here for scholarship instructions and an application. Applications are due March 15. 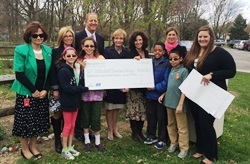 Six Cherry Hill schools have been selected for this year's RecycleBank Green Schools contest, which provides schools with the grant money to promote environmental education projects. The participating schools are: Beck Middle School, Cherry Hill East, and Cooper, Clara Barton, Bret Harte and Joyce Kilmer Elementary Schools. You can help these schools reach their goal by donating your own, unused RecycleBank points in support of their projects. RecycleBank will donate $1 for every $250 points donated, up to $2,500. Last year, Woodcrest Elementary received a $2,500 Green Schools grant for its outdoor garden. To learn more about the Green Schools program, read each school's project proposal, or to donate your points, visit www.RecycleBank.com/contest. Good luck to each of our schools! Extreme cold is in the forecast this weekend, and a Code Blue Advisory is in effect from 6 p.m. Friday, Feb. 13, until 7 a.m. Saturday, Feb. 14. Such extreme temperatures present significant health and safety challenges, and the Cherry Hill Office of Emergency Management reminds residents to be prepared and take these potentially dangerous conditions seriously. We remind residents to check frequently on friends and neighbors who are elderly or disabled, and to keep pets indoors to ensure their safety. If you or someone you know needs assistance finding a warm place to stay, please contact the Office of Emergency Management at (856) 432-8836; after hours, call Police Dispatch at (856) 665-1200. Click here [http://www.cherryhill-nj.com/CivicAlerts.aspx?AID=666] for additional preparedness information from our Office of Emergency Management. At Monday night's Township Council meeting, Mayor Cahn and Council were proud to honor Cherry Hill West senior Dan Joffe, who helped to coordinate the Township's Martin Luther King Day of Service on Jan. 19. As a result of Dan's efforts, the Township and more than 150 volunteers collected donations for five local charities, and completed much-needed improvements to our public lands at Croft Farm. Thank you to Dan and all of our MLK Day volunteers for all of your hard work and dedication to making our community stronger. Click here [https://www.facebook.com/permalink.php?story_fbid=10153133812759656&id=134342599655] for additional photos from Monday night's presentation. Children ages 4 and up are invited to this introduction to Spanish. We'll meet to practice our new vocabulary with bilingual stories, songs, and more! Click here [http://host6.evanced.info/cherryhill/evanced/eventsignup.asp?ID=6261&rts=&disptype=&ret=eventcalendar.asp&pointer=&returnToSearch=νm=0&ad=&dt=mo&mo=2/1/2015&df=calendar&EventType=ALL&Lib=&AgeGroup=ALL&LangType=0&WindowMode=&noheader=&lad=&pub=1&nopub=&page=&pgdisp=] to register. Calling all fans of the popular Who Was series! Join us each month as we learn about a different famous person from the past. This month we'll learn about Harriet Tubman. Open to grades 1-3. Click here [http://host6.evanced.info/cherryhill/evanced/eventsignup.asp?ID=6232&rts=&disptype=&ret=eventcalendar.asp&pointer=&returnToSearch=νm=0&ad=&dt=mo&mo=2/1/2015&df=calendar&EventType=ALL&Lib=&AgeGroup=ALL&LangType=0&WindowMode=&noheader=&lad=&pub=1&nopub=&page=&pgdisp=] to register. This hands-on class goes beyond basics of searching the Web and introduces more advanced techniques. The class will explore the web browser, various web sites, and searching the Internet. Audience Level: Adults with PC experience required. You must be able to use mouse and keyboard. Click here [http://host6.evanced.info/cherryhill/evanced/eventsignup.asp?ID=6277&rts=&disptype=&ret=eventcalendar.asp&pointer=&returnToSearch=νm=0&ad=&dt=mo&mo=2/1/2015&df=calendar&EventType=ALL&Lib=&AgeGroup=ALL&LangType=0&WindowMode=&noheader=&lad=&pub=1&nopub=&pa] to register. Sing along to one of your favorite movies! We'll be screening Disney's Frozen and invite kids of all ages to join in the musical fun. Feel free to dress up as your favorite Frozen character for this event! Click here [http://host6.evanced.info/cherryhill/evanced/eventsignup.asp?ID=6231&rts=&disptype=&ret=eventcalendar.asp&pointer=&returnToSearch=νm=0&ad=&dt=mo&mo=2/1/2015&df=calendar&EventType=ALL&Lib=&AgeGroup=ALL&LangType=0&WindowMode=&noheader=&lad=&pub=1&nopub=&pa] to register. Seniors: Free tax-prep help available every Tuesday, Friday until April 15 Cherry Hill Township and the AARP have once again partnered to offer seniors free tax-preparation assistance from 10 a.m. to 2 p.m. every Tuesday and Friday until April 14. No appointments are necessary. All tax-prep sessions will take place in the N. John Amato Council Chambers (Room 208) at Town Hall. Electronic filing and direct deposit are available to help expedite returns. Click here [http://www.cherryhill-nj.com/CivicAlerts.aspx?AID=663] for more information, or call the AARP directly at (888) AARP-NOW. Winter can wreak havoc on road surfaces, and we inevitably see a spike in potholes popping up across town during these cold, snowy months. The Department of Public Works is responsible for the repair and maintenance of nearly 260 miles of municipal roads, and has dedicated crews assigned to the task of filling these potholes as quickly as possible. You can report an area of concern online by clicking here [http://www.cherryhill-nj.com/forms.aspx?FID=86] , or by calling Public Works directly, Monday through Friday, at (856) 424-4422. Click here [http://www.cherryhill-nj.com/index.aspx?nid=219] for a list of roads that are maintained by Camden County or the New Jersey Department of Transportation. Drive safely! The Cherry Hill Fire Department EMS Training Division has several classes scheduled in the coming months. To learn more, or to register for a specific class, click here [http://www.cherryhill-nj.com/index.aspx?NID=884] . Seniors graduating from any Camden County high school in 2015: If your passions and field of study toward your career goals include a field that supports sustainable living, or you want to be an agent of change in the world around you, apply for this new scholarship being offered by Sustainable Cherry Hill. Please click here for scholarship instructions [http://origin.library.constantcontact.com/download/get/file/1102336365878-508/SCH+Scholarship+Instructions+Spring+2015.pdf] and an application [http://origin.library.constantcontact.com/download/get/file/1102336365878-507/SCH+Scholarship+Application+Spring+2015.pdf] . Applications are due March 15. Six Cherry Hill schools have been selected for this year's RecycleBank Green Schools contest, which provides schools with the grant money to promote environmental education projects. The participating schools are: Beck Middle School, Cherry Hill East, and Cooper, Clara Barton, Bret Harte and Joyce Kilmer Elementary Schools. You can help these schools reach their goal by donating your own, unused RecycleBank points in support of their projects. RecycleBank will donate $1 for every $250 points donated, up to $2,500. Last year, Woodcrest Elementary received a $2,500 Green Schools grant for its outdoor garden. 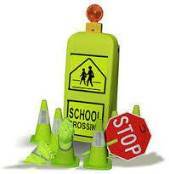 To learn more about the Green Schools program, read each school's project proposal, or to donate your points, visit www.RecycleBank.com/contest [https://www.recyclebank.com/contest] . Good luck to each of our schools!